I hate walking in the rain and am often called "Fairweather" by the "Boys" because of my reluctance to walk when our climate takes a turn for the worse. I am therefore equally reluctant to "book" walks in advance just, particularly outside of the summer months, in case conditions get "soggy". Well it’s hard enough doing a long walk without having the elements against you. Because of this it was not until Saturday 7th October 2000 that Mick and I decided we would have a go at the Hope Moors and Tors Walk. A quick phone call to the organisers confirmed that we would be accepted and so in the early hours of the next day Mick collected me and we were soon speeding up the M1 to Hope and the start of this "Challenge". By 8.30 a.m. we had started. 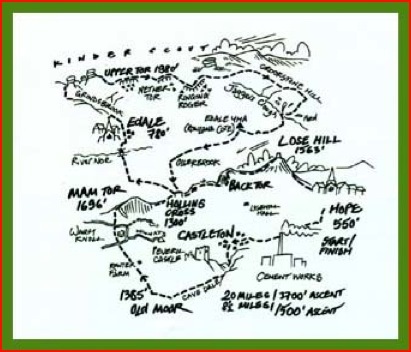 As we had not received the full details of the route before we arrived at Hope we could have been at a disadvantage. However, I had obtained the check point locations and had been able to "figure out" the route and this information I had input into my GPS on Saturday. So although we had the appropriate map and the organisers route we let the Global Positioning System "Gizmo" (GPS) do most of the navigating, which it did very successfully. Having left the Hope College, the start of the walk, we turned right (east) right again up a minor road and at some trees turned right to follow a footpath behind the college which we followed to Castleton. Unlike most of the other walks we have done, the "Moors and Tors" does not have a mass start and walkers can start when they like providing they are off by 8.30. So we only just made it and it certainly was a strange feeling to realise that we were the probably the last "out" and whereas you usually have other walkers to follow, today, at least at the start, we were on our own. Soon we came to a wooden stile, which was damp and muddy from earlier walkers’ boots, and Mick slipped. Fortunately he was able to reduce the impact of his fall onto the ground by using his left hand, and although his hand ached during the day the damage could have been a lot worse. Lesson One for the day was therefore beware of damp and muddy stiles. Soon we were approaching Castleton and passed a group of other walkers. We were no longer last and I celebrated with chocolate as we walked up Cave Dale. Mick is fond of the energy giving ability of Mars Bars. I’m a Snickers man myself and after a couple of bites I really felt energised and better able to get to the top of Cave Dale. At the top it was right along a broad grassy track and we came to the first check point. However, like most check points or control points on the walk there was no one there but some one had been there before and left a "puncher" to allow us to mark our control cards which would verify we had completed the route and not done any "short cuts". As with all walks it’s important that you always get your "card" marked, as failure to do so will disqualify you. But we weren’t thinking about such matters as we walked a further mile and, with Mam Tor getting closer, came to a marshalled control point at the roadside. Here was an opportunity to have a drink of water or squash supplied from the "boot" of the marshal’s car before crossing the road and starting the steady climb to Mam Nick and then Mam Tor. Needless to say Mick with his younger years and superior fitness got to the top before me but I soon caught him up, or did he wait so we could enjoy the stroll down to Hollins Cross together. Hollins Cross was the 3rd and 8th control point and we were reminded in the walk details not to punch the 8th part of the card now. It would be scrutinised at Edale. My only concern was would the "puncher" still be there when we needed it on our return to the "Cross". A number of children nearby were very curious about this "puncher" which was fixed to the top of an upright cane with ribbon on it. From here we followed the track signposted "Barber Booth" and on reaching a lane we followed it to the main road and soon we were at Control Point 4, in the main car park in Edale. Our cards were scrutinised, particularly the part where the 8th punch would go, and although I can’t remember the time we obviously got there before 11.30 a.m. If we had been later we would not have been allowed to proceed to the next section. Which, at the time, I felt was a great pity as I looked up and saw Kinder looming in the distance. At this check point we had intended to fill our water bottles up but no water was available, and we never really thought about our liquid needs for later on in the day, except the pint of beer we would "murder" when we found a pub on our way home. So it was farewell Control Point 4, and with 7 miles behind us it was time for the grind up Grindsbrook Clough. 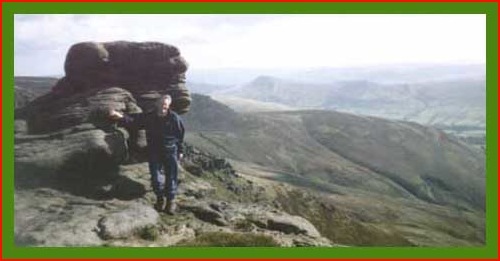 I was reminded at this point of the last time I had climbed up Grindsbrook. A group of us from work, the infamous "Northgate Strollers" had come up by minibus one Saturday to experience the delights of this part of the Peak District. We looked forward to an enjoyable days walking, but it rained. When we parked in the road in Castleton below Hollins Cross it was raining. It rained all the way over the "Cross", and was still raining when we were attracted to the dryness and warmth of the inside of the Nags Head in Edale. Here we forced ourselves to sample the "brewers delights", but when we got out it was still raining. I think it actually had got worse. Grindsbrook Clough was a torrent and it took a great deal of ingenuity to cross to its west bank without getting our boots full of peaty water. However, today was so different. The sun was shining. It really was a beautiful day and both Mick and I were regretting not wearing our shorts as he walked, and I toiled up the "Clough". At the top we came across the next control point, and another "click" on our cards, and looking at the instructions found we had now completed 9 miles. 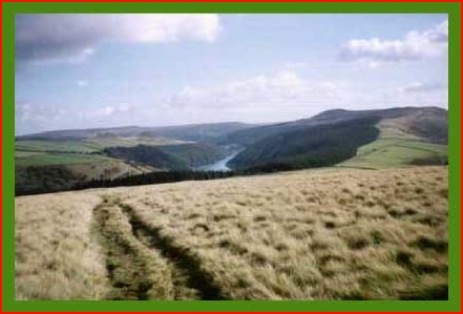 But the next point was 4¼ miles eastward just before the Ladybower end of the Kinder Plateau. We did a mile or so and then stopped for food and then realised we had very little water. Mick and I had both intended to fill up at Edale. Neither of us had, and we had only about ¼ litre between us. So I was generous and shared it with Mick as a reward for waiting for me on the hilly bits. Lesson Two for the day; make sure you’ve got sufficient water. Lunch over, the GPS really came into its own and I was amazed that it directed us to exactly the right point for coming off the plateau. So we said goodbye to the wonderful views we had enjoyed on Kinder for the last hour or so. 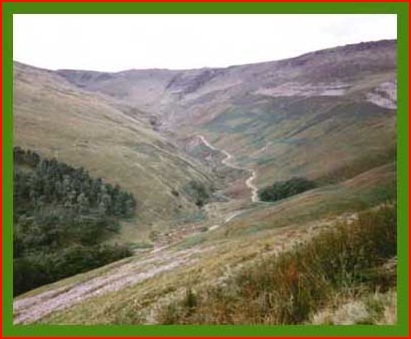 Soon, having clipped our "cards" at the next check point, grid reference 159876, we walked in the afternoon sun to the next check point at the Edale Youth Hostel at Roland Cote and water, and for me memories. Rowland Cote was reached and we enjoyed our first good drink since before we climbed Mam Tor 11 miles ago and I suppose at least 3 hours earlier. The last time I was at Rowland Cote was over 40 years earlier when I visited the Peak District as one of the pupils from the secondary school I attend. At that time Lonnie Donegan was the main pop idol and I remember listening to records of him and to someone singing "Green Grow the Rushes O" in the common room at Rowland Cote in the evenings. I must have been there just as pop music was invented. But enough of these childhood reminiscences we still had 4¾ miles to go. So it’s down the hill from Rowland Cote, right along the main road towards Edale, and left along a lane towards Back Tor Farm and then the ascent back to Hollins Cross and another punch made on the control Card. The "puncher" was still there. From here we followed the Great Ridge eastwards over Back Tor and on to the summit of Lose Hill and the last "card puncher". By now, which was about 3.45 p.m., it was getting cooler so fleeces were put on for the last part of the walk which was just under two miles and it was downhill all the way. We expected to get to the end of the walk easily within 8 hours but with the success of the GPS on Kinder we continued to use it as we approached Hope rather than follow the instructions we had been given at the beginning of the walk. We went the wrong way. However, it was not a disaster but it did mean we had to run the last 100 yards or so to finish in 8 hours. This was certainly one of the best routes of any of the challenge walks I have done and although the distance makes it one of the shortest, the hills, 3700 ft of ascent, certainly make up for this length deficiency. The only downside is you don’t get a proper supper. OK, you get tea or coffee and there were biscuits but it’s not the same as meat pie and mushy peas. However, we did stop for that pint on the way home. Mick knew a decent pub at Bradwell, just south of Hope. I can’t remember its name but I’m sure Mick can. Although Mick and I did consider doing it again in 2001 we never got around to it but we did it with Peter and Larry in 2002. However, Rob, one of the friends of my son Greg, did do it. His time 4 hours 55 minutes. Oh to be young and fit.